Box size: 8&frac58; x 10&frac58; x 1⅞ in. What a Ball by Stephen Huneck (American). At Dog Mountain, Stephen Huneck devoted 150 acres of Vermont hillside, a clapboard chapel, and countless works of art to canine friends everywhere, starting with a black lab named Sally. 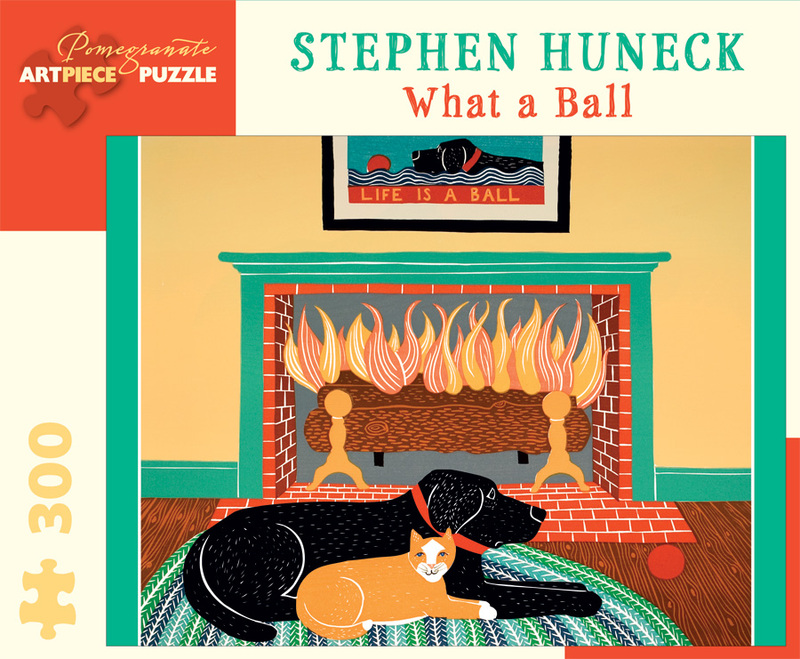 She inspired Life Is a Ball, his first of many woodcuts that celebrate life and the emotional connection, moments of levity, and reassuring quietude dogs offer their companions. That woodcut, now widely known, reappears above the fireplace in What a Ball. Thoughtfully conceived and engagingly intricate, Pomegranate’s 300-piece jigsaw puzzles combine superb color reproduction, stunning and unusual images, and sturdy construction to delight generations of novice and veteran puzzleworkers.